Brighten up the day of someone special with a bright and colorful arrangement of striking flowers. This elegant and striking bouquet is overflowing with colors and textures that you can only find in the tropics. 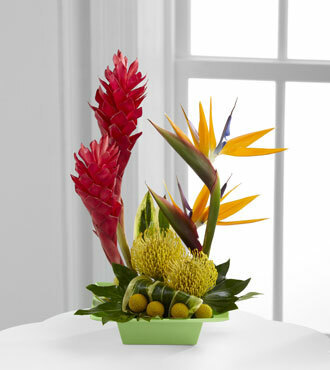 Red ginger, Birds of Paradise, yellow pincushion protea and vibrant tropical greens are carefully arrangement inside a square bowl to create a flower arrangement that will bring joy and happiness to someone's day. This bouquet is also perfect for celebrating a birthday or congratulating someone for exciting changes in their life.